During the Fifties Allard prospered, especially in America, where the cars were a key part of the revival of sports car racing. Yet by the end of the decade, with the ascendancy of Jaguar, Triumph and MG, Allard and his cars were bypassed. Sydney’s last flings were to tune up the Ford Anglia and to race dragsters of his own design. With the Allard company becoming main agents for the Shorrock Supercharger, Allard developed a modified version of the Ford Anglia 105 and 109E Anglia, called the ‘Allardette’, which was produced in sufficient numbers to be homologated to compete in the the modified saloon class in International rallies. As a rally car the Ford Anglia wasn’t the fastest machine by any means, but it was reliable. 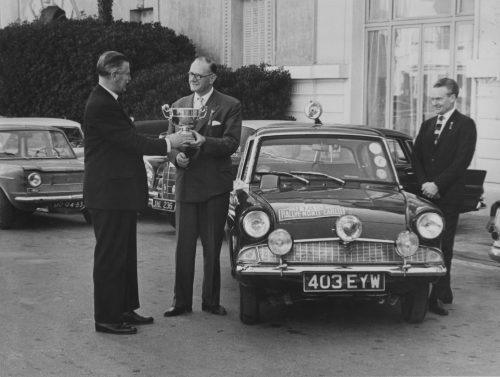 In 1963 the season began with Sydney Allard winning his class on the Monte Carlo Rally with son Alan second, both driving the infamous Allardettes. On the Safari Rally across Africa an Anglia finished second out of just seven finishers. To improve performance, the Allardette was a Shorrock Supercharged Anglia with disc front brakes and suspension modifications which saw figures upto 68 bhp or so (seven more than the Cooper-Mini of its time), along with studded tyres and a determined driver this little car could really achieve some astonishing results. Allard Sports Cars are currently in the process of restoring a 1960 ‘Allardette’ at their workshop in Gloucester – hoping to recreate an ‘Allardette’ in which Allan Allard raced back in the 1963 Monte Carlo Rallye. Click here to follow the story. Allard ‘Allardette’ racing in the 1963 Monte Carlo Rallye. Sydney receives an award for highest placed starter in 1963 Monte Carlo Rallye. The idea for the name ‘Allardette’ came from a Mr. James Watt, a motor enthusiast who had previously been a sales manager for Aston Martin. He approached Sydney back in 1958, at a time when the company was looking for new business, after the demise of car manufacturing. Watt thought that there was a market for what we would now call ‘customising’ a small Ford saloon. He chose an Anglia 100E, the new Anglia 105E was not announced until towards the end of 1959. Adlards Motors lent him a car for a few weeks to see what he could do with it. When it was returned with Allardette badges and bodywork modifications, it can only be described as bizarre! At the rear it had tail fins, with orange plastic windows set into them and at the front it had large hoods above the headlamps, which added more drag to an already slow car. Later in an attempt to reduce the drag I added perspex covers, but it was still a struggle to reach a top speed of 72 mph! Finally it had two tone paintwork with a black roof and salmon pink body. Needless to say, Mr. Watt was not asked for his services again. 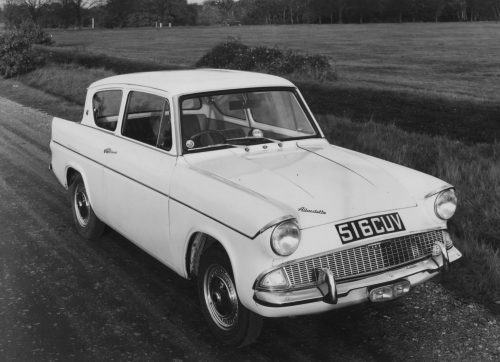 However, the idea for the name had been sown and a couple of years later, after the Anglia 105E had been launched, we decided to market a modified Anglia as an Allardette. In September 1960, the Allard Motor Company issued a press release, which gave the sad news that the company had ceased car manufacturing and would no longer be taking orders for new cars. In fact, the last car had left the works in 1958. In the same month, Sydney concluded an agreement with Chris Shorrock and the Rubery Owen Group, who owned Shorrock superchargers Ltd. at that time, for Allard Motor Company to become the world distributor for Shorrock superchargers. Although Allard had previously marketed a few engine tuning parts for Ford cars, this marked the start of a new venture for the much reduced Allard Company, with the marketing of motor accessories and tuning equipment for Ford cars and Shorrock supercharger kits for a whole range of vehicles. Over the previous few years, as Allard car sales dwindled, Allards had gradually reduced its workforce and its remaining staff and facilities had been absorbed into the growing associated Ford Dealership, Adlards Motors. At no time was the Allard Motor Company put into receivership or formally closed down. From 1957 onwards Sydney was looking for lines of business for the remaining Allard staff and make use of the work area. These included some successful and some unsuccessful ventures, such as the Allard Clipper, the atom dirt track race car, LCC ambulance de-dion axle conversion, Golde car sun roofs, Shorrock superchargers and the Allardette Anglia conversions. The Allardette modifications applied to the Ford Anglia comprised of a C75B Shorrock supercharger, front wheel disc brakes, additional anti-roll bar, anti tramp bars and there was a long list of optional extra tuning parts. Gerry Belton joined Allards in 1961 as marketing and publicity manager. With widespread advertising and special events, such as hiring Brands Hatch circuit for a day for journalists and others to test a range of supercharged cars. Supercharger kit sales grew, even reaching a sale of 75 kits in one month, surprising for such a specialist and comparatively expensive conversion kit. From 1961 we developed the Allardette components and conversions based on the Ford 105E Anglia. In 1962 the 997cc Shorrock supercharged Allardette was FIA homologated, shortly followed by 1198cc naturally aspirated version. The Allardettes were sold as either complete converted cars from Adlards Motors, or as a conversion kit from Allard. More cars and conversions were sold when the 1340cc engine became available with the announcement of the new Ford Classic and followed by the 1500 GT engine, when the Cortina GT appeared in 1962. Sydney, with co-drive Tom Fisk, drove a group one 105E Anglia in both the 1961 and 1962 Monte Carlo rallies. The modified Allardette Anglias, not yet homologated to make them approved for this event. I also entered the Monte Carlo in 1962 with co-driver Rob Mackie in an almost standard 105E Anglia. The supercharged 997cc Allardette Anglia was FIA homologated in 1962 in time for my father and I to each enter a supercharged Allardette in the 1963 Monte. My co-driver was Rob Mackie, a friend from school days. Both cars completed the course. Sydney finishing in 33rd place and myself in 51st out of some 350 starters and 200 finishers. The Shorrock supercharger installation with no other engine modifications increased engine torque considerably on an engine with very little torque in standard form and power was increased from only 39 bhp to around 72 bhp at the same maximum rpm with the supercharger. In 1963 we started fitting the 1498cc Cortina GT engine, together with the larger C142B Shorrock supercharger, raising power output to 128 bhp at 6000 rpm. I spent the 1963 season racing at various circuits around the country in a modified Allardette setup with this engine. It proved quite competitive. John Young, one of the most successful Anglia racers bored and stroked the engine and managed to increase capacity to 1720cc I believe. We went on to develop the supercharged engine for my Dragon Dragster, which delivered 175 bhp running on methanol. With further development, it could have produced much more power, as I did with the Allard drag racing Anglia (Dragoon) a couple of years later. 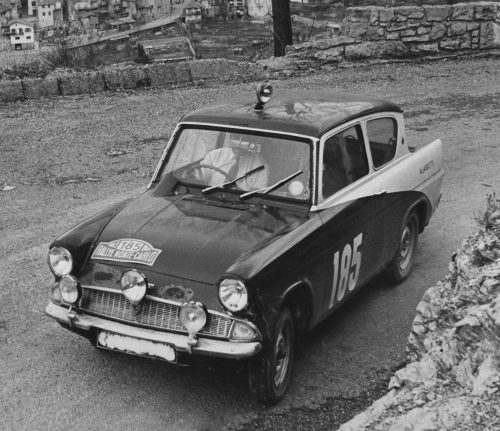 The Allardette Anglias were driven in 1964 Liege-Sofia rally. At that time this event was the longest, roughest and toughest rally in Europe and possibly in the world, with 90 hours of almost continuous driving, there being only a one hour rest stop in Sofia, the capital city of Bulgaria! In fact, the rally regulations said we had 96 hours to complete the race (rally! ), but when you added up all the times for the rally stages, total time allowed was only 90 hours, which turned the return leg into a race across Europe, where anything went if you wanted to finish within the time limit getting back to Liege.